After years of poking and prodding the City of San Francisco has made the oval all it can be. It's 7/10 of a mile long, 18 ft wide, banked for 30 mph, and SMOOOOTH! 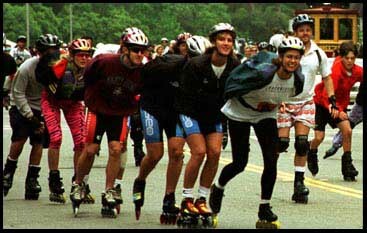 I'm Chair of the Technical Grounds Sports Sub Committee of the SF Rec and Park and a skater in the park for 20 years. As Chair I've been involved in getting the city to spend about 1.2 mil on soccer fields in the past two years. (I also helped run my fathers paving business summers through high school and college) I know FLAT and SMOOTH. After the city resurfaced the grass field at the Polo, they insisted that there be a fence to keep people off of it. The Bicycle Coliation and CORA insisted that any fence allow unrestricted access to the track. re: the fence must go around the inside of the track. The Park staff insists that the fence be placed in the track surface so that they won’t have to deal with grass growing up through the fence. ENTER ME. I took a nice photo of the Roller Devas and put it with calculations on how it would cost the city $28,000 to simply take down such a fence and put it back up after paving and told them how we’d all LOVE them to pave it before putting the fence up. I sent it to all of the members of the Park Board, and therefore the track resurfaced. It's glorious, we're talking world records. And it's open to the public. Dust off those old wheels in the closet and roll on out.